Discussion in 'Worldwide MMA Discussion' started by shonuf, Jun 5, 2014. Thompson is the favorite, is that right ? Mind you, I haven't seen Prindle or Thompson fight in ages. just ready to see some fights, man. Bring it on. Hoping Thompson gets Prindle out of there quick, for the dark gods. I'll find this in my DVR some time next week and probably after i pull up the RFA event. Prindle is abysmal on the ground and that's where most of thompsons fights go. Going to this event even though bellator pulled a bait and switch on me (was really forward to Curran vs Pitbull 2 and then they switch it a week after I buy seats ). Luckily the two other Winstar cards I've been to have been amazing and the price was good ($62 with fees to sit in the 4th row). War JT!!! The Warwagon lives! If Sokoudjou wins, hopefully he doesn't need to be pulled off his opponent after the stoppage by a truckasaurus. Damn you, Pat Curran. Damn you to Hell. Truly, a card for the ages. I wonder if ESPN puts the results on their bottom line this time. They should. The whole world is clamoring to find out who won between Colossus and Prindle, Lins and Heidlage. 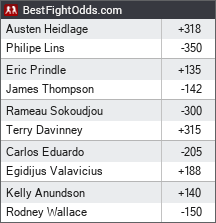 In all seriousness, it would have been more respectable if they put Sokoudjou vs. Lins in the tournament, and had that as the main event. Then you get the name, but a possible real deal too who could make his. Ah well, it's in the past. Now I'm trying to figure out what on this card I can sink my teeth into. The prelims are decent I suppose. Ayme is on there. He'd be on my ones to watch for this upcoming Bellator season. The same goes for Lins. I guess that's the little lure. Like Bellator, I still have some hope for Eduardo too. I'm pleased they gave him another shot. Now, hopefully he passes another real test in ValVenis. I think Venis comes at him so it won't be like against Wallace, but if he doesn't, this time Eduardo needs to cut off the cage better and actually bring a more well-rounded attack to the table. I normally don't join the mob of irrational idiots who lash out at fighters for pulling out of fights they wanted to see due to injury, but there are exceptions, and I think this is one of those cases. He bowed out a few weeks away from fight night due to a calf injury. I mean how much of an impediment is that, really? It sounds like the level of injury most fighters pick up in camp. And he kind of reinforces it wasn't serious by saying, "but next month I'll be fine". This also seems commonplace for him now to delay fights for a minor issue or because he needs a mental break. He's made it evident he doesn't like fighting that much, and has contemplated retirement, even though he's near or on top of his division. If I'm Bellator, and now have settled our differences with Pitbull, I"m hoping he wins and reigns as champion for a while because he provides them by far the best combination of excitement and reliability.